Do We Have the Right to Judge Other People? Since when do we think it’s alright to condemn someone when we don’t know all the facts and don’t even bother to consider their side? In “Tribunal,” an episode in the second season of Star Trek: Deep Space Nine, Chief Miles O’Brian heads off on vacation with his wife, but he’s arrested by Cardassians before they can reach their destination. 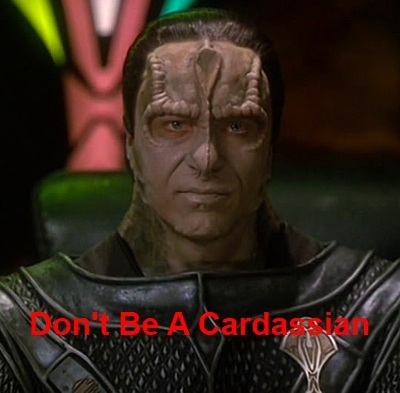 The Cardassians refuse to tell O’Brian what he’s been charged with. According to the Cardassian legal system, the charges aren’t announced until the trial. “How can we prepare for the trial if we don’t know the charges?” O’Brian’s wife asks. True guilt or innocence, extenuating circumstances, none of it mattered. While this might be an extreme situation, we do it almost daily on a smaller scale. We judge people even though we have no idea what their lives are really like or what goes on in their head and heart. I was hurt by this recently. I set goals for this year that I felt would allow me to achieve my dreams while still enjoying my life and being fair to my husband, family, and friends. I didn’t set these goals hastily. I looked at what my life was and what I wanted it to be. Talked with my husband. Considered the implications. But when I shared my goals with a friend, she felt free to criticize those goals, calling into question my work ethic and suggesting I wouldn’t succeed at my dreams if I held to those goals. The judgment on me was delivered without any real knowledge of how hard I planned to work, how dedicated I am, or what other responsibilities I might be juggling. She doesn’t live in my house, let alone in my skin. I know this person meant well, and I’ve worked through the anger, hurt, and self-doubt the words caused. But I’ve wondered since if this person stopped to think about how those words might affect me, or did she value speaking her mind and being “honest” over everything else? Did this person stop to think that her way might not be the only way, might not be the best way? Did this person consider that the type of life I want isn’t wrong simply because it’s different from hers? And I think those are questions we all need to ask ourselves when we feel the need to give our unsolicited opinion. We seem to have this tendency to judge people when we haven’t walked in their shoes and never can because everyone’s life is different. I’ve done it. And it was arrogant of me. When we criticize the woman who says “no” to volunteering at the food bank, or at the cancer walk, or at the fundraiser for juvenile diabetes, we can’t see that she spends her days caring for her elderly parents and that her body aches so badly in the morning she can barely get out of bed. When we criticize the family with the unkempt yard, we can’t see that both parents are working double shifts to save enough for their kids to go to college and spend what little free time they have helping with homework. When we tisk-tisk the woman in front of us at the grocery store because her cart is full of paper towels and she should use washable cloths because it’s better for the environment, we can’t see that she’s got three children at the age where potty training accidents, vomit, and spilled juice are the norm. It’s so easy to talk about what someone else should do. It’s so easy to think our lives are more difficult than anyone else’s. But in truth, we don’t know what happens behind closed doors and everyone has their own private struggles. I know there are times when we need to speak the truth in love because a person is doing something that could hurt themselves or others. There are times when someone wants our opinion. But unless that’s the situation, perhaps the best policy is to shut up and give people the benefit of the doubt unless there’s something we can do to make things better for them. What do you think? Have we become too quick to judge others? What do you think is the best way to handle it when someone judges you unfairly? Should We Bother Making Resolutions? Awesome, Marcy. I’m guilty of it. I have ridden my high horse in many situations where I might have been better to humbly walk beside my fellows. This said, with age comes perspective, and I’ve improved. I am nevertheless grateful for the reminder. I will admit that when I was younger I was rather unyielding, but I hope it’s something I’ve improved on as I’ve gotten older. The last couple of years, I’ve definitely noticed myself becoming frustrated when I hear other people making assumptions and passing judgment. I love your advice about letting people know what we want from them. There is a difference between going to someone for advice and their opinion on something vs. going to them because you want someone to cheer you on, celebrate with you, or make sure you’re following through. I’m a fixer by nature, so I know how tempting it can be to want to always offer solutions, but sometimes people don’t want you to try to fix them. Insightful article! We’re all guilty of putting on that judgmental hat and thinking we know best. But as you said in your post, we haven’t walked in the other person’s shoes or lived in their house. I like what Emma said in the previous comment about telling people what you want from them. A hug, excitement or a quiet listening ear may be all that’s needed. And with some people, we may need to “edit” what we tell them. As sad as it is to think, you’re probably right that with some people we’ll need to edit ourselves a little. And that part of it will always be a learning process because we go in thinking we don’t need to edit ourselves with the people who matter to us, and have to learn by stubbing our toes what’s safe to share with each person and what isn’t. This gave me a smile. My husband learned very quickly to ask, “Do you want me to offer solutions for how to fix this or do you just need me to listen and give you a hug?” I think he had a head start understanding woman-speak even before we got married, though, because he was raised by a single mom. I’m so sorry that your friend responded like that when you told her your goals. My first reaction when people share goals or success stories is to reflect on what I have or have not done, which is totally bad. I think it’s human nature, like Emma said. Still, what I say after my initial reaction is to support my friend, not tell her that she’ll never make it, or how her success won’t last. Because I don’t know that. She might achieve all of her goals and become a huge success. And really, that’s what I truly want for her, deep down underneath my jealousy/insecurity/fear of failure, etc. I think judging comes from a place of fear ~ fear of the unknown. Fear that someone is different from us, and therefore possibly better. It’s a vicious cycle, judging. I love your examples above ~ we don’t live in someone else’s shoes and should never, ever, place our expectations on them. I think it was the Dali Lama who said, and this is a paraphrase, ‘Just because someone isn’t walking on your path, doesn’t mean it’s the wrong way.’ I love that. It’s exactly what you’re saying here. We need more compassion in the world and less judgement. Thanks for the reminder. Even though I try not to judge, I’m sure I still do and today I’m going to focus on making sure I accept what comes my way for what it is, not what I want it to be. You and Melinda must have read each other’s minds 🙂 Such a great quote. I think you’ve hit on something that’s important to remember. When we care about someone, we do want them to succeed, even if their success or them going about trying to succeed in a different manner than we are might frighten us, make us jealous, or bring our securities to the surface. In the end, we really do care about them and cheer with them, regardless of what’s going on with our own emotions. I think this ability to step outside ourselves and our needs/goals and our experiences is necessary to be truly adult in our thinking. As children, we don’t consider that others have lives at all–the world revolves around us. We slowly start to realize that not only do others have lives, but that they also have their own thought processes, troubles, and reasons for doing things. I enjoy the way you handle difficult topics. You manage to discuss issues on your blog that could explode, but you do it in such a way that everyone feels safe and free to share. The first big fight my husband and I had was about how “honest” he was about what he thought of my father after he met him the first time. While everything he said was basically true, he had no right to judge my father (who was storming the beach at Normandy at the age of 14) or me and how I had learned to deal with him. I told him where he could shove his so-called honesty, and he’s never judged another member of my family since. He and my father became great friends before my father died, and I think he learned all on his own how harsh his intial judgement was. The thing about words is that you can never take them back, and they can cause so much damage. Like Chad said, most of become more aware as we get older, but I do think it’s important to let someone know when they’ve hurt our feelings. Sometimes they are really not aware. Thanks for the post, Marcy. It’s a good reminder. The second person is the one you described. They don’t take time to put themselves in your shoes. If one follows my trusty manual, it says, “Take the log out of your own eye, before you judge others.” Or something along those lines. As for the topic at hand, I think it’s necessary to be judgemental. Without going into a big long rant, I think it’s a survival tactic to look at a situation and make a call on how to handle it…and any time you interact with a person that’s a situation. Granted, adaptability is king, and I think you should always be able to revise that judgement at the drop of a hat, so it’s best to not overreact. As for you and your friend…I imagine this person probably wasn’t very careful with what they said, so bad on them…but in my opinion, don’t ever tell someone a secret you don’t want repeated, and don’t ever tell someone about a thing (issue, whatever you want to call it) when you don’t want advice. Marcy, I am stunned by this every time it happens. I tend to be a sensitive person and I pick up on others feelings. Sometimes that is a good thing. Then other times it is not. Because I carry their feelings along with my own. But none of us knows what it is like to be that other person. What I think what hurts the most is when this attitude comes from someone we know well. Yet, do they truly know us? Have they invested the time like we have in them? Do they give us the benefit of doubt in return? All of us live different lives. And a whole lot of us have an over-flowing plate to balance. It is said that you cannot be judgemental and also be compassionate. It just doesn’t work. I think what everybody is saying about people projecting their own fears or assuming your life is the same as theirs is all part of this kind of judging. But it’s also coming from an attitude we have in our society these days. In our efforts to bolster people’s self-esteem and encourage them to pursue their goals, we’ve come to believe some unrealistic things. It sounds like your friend probably meant well; she was trying to encourage you to pursue your dreams. But you were looking at reality. You stick to your guns, Marcy, and keep setting realistic goals! Snarking an anonymous paper towel user at the big box store and being transparent with a friend are two very different things. I wasn’t there and I don’t know the relationship, but just because someone says something that we don’t want to hear, that doesn’t make them wrong. If someone is truly a friend, it’s their job to say the hard things. A few times in my life, friends have told me things I didn’t want to hear. Perhaps they had no right, except for the fact that they knew me and loved me and heard or observed something that set off the klaxons. So, they said the things to me that I didn’t want to hear, because that’s what true friends do. Sometimes I listened and sometimes I just resented their words. Sometimes the friends were right on, but just being my friend didn’t mean they were always right either. When a true friend says a hard thing, I’m grateful for their honesty. What I do with what they say is up to me. I’m really sorry that happened, Marcy. Especially coming from a friend. That hurts. I tend to agree with Austin in that whenever we share information with others, it’s human nature for them to return with unsolicited advice. Biting one’s tongue is a skill not mastered by all. We can only hope to lead by example. BUT, that being said, Jane is also right. A true friend shouldn’t sit back and let us go full steam ahead with a faulty plan. They would say something and force us to take a hard look at what we are doing and why. That’s what friends do, they look out for each other – like family, and it isn’t always easy. So she may have thought that’s what she was doing, making sure you saw all the pieces properly before you jumped in. I know I had a very different idea about how I was going to attack my business plan twenty years ago then what I was actually able to make happen. But each individual is different, and with that, what they are able to achieve will vary. Huge hugs, Marcy. I hope your friendship pulled out basically unscathed. I returned to work when my younger child was nine months old and took flak for that decision from other mothers I knew. Wouldn’t you know, I worked in a field where overtime was expected and those who went home at quitting time were slackers. In other words, I was judged and found wanting at work and in the neighborhood. The experience made me less likely to judge. It also made me think about what triggers another person’s opposition. Concern? Jealousy? An if-you’re-not-with-me-you’re against-me stance? We all define success differently. Pursue your idea of success, Marcy. I put some serious thought to this topic, because I know I have been on both ends of the stick. I am WAY more judge-y than I used to be. I’m not necessarily proud of this trait, but I think it’s a necessary phase I must pass through before the pendulum evens out in the middle: I used to doubt my every decision and would always bend to public persuasion, even as I resented doing so. That was one extreme, and now I’m at the opposite extreme – I have confidence in my own opinions, but unfortunately I do tend to attack others, I guess so that I can hit them before they can attack me. Again, this isn’t something I’m proud of. Just thinking it through here as I comment. There’s got to be a perfect medium, where personal growth means not only accepting yourself, but accepting others as well. I’ve got a long way to go down that road.